omid (mashhad, Iran) on 18 June 2013 in Landscape & Rural and Portfolio. Wow! Straight ahead to the moon? Nice shot! Fantastic shot Omid!! 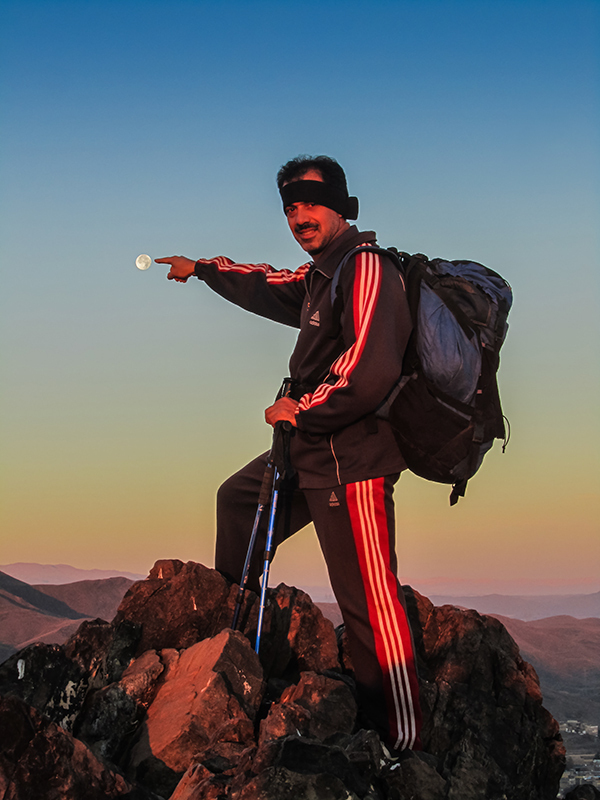 The moon looks as if it is very close to him !!! Nice work that reminds me of the saying: "When the wise man points at the moon, the foolish looks at the finger"...! بهترین چیز رسیدن به نگاهی است که از حادثه عشق تَر است"
مهربانی هایت را پاس می دارم"
"بهترین چیز رسیدن به نگاهی ست که از حادثه ی عشق تَر است"
. . only another 384,400 km to go ! Magnifique portrait dans la lumière du soir ! Super le coup de la lune ! دسته ای از کوهنورد ها هستن که من بهشون میگم کوهنورد های کثیف. اینها برعکس خیلی جوونای تازه کوهنورد شده تجهیزات آنچنانی و کفش های گروه و لباس های اصل نمی پوشن. اما تو کوه مثل گرگ می مونن. نه سرما می لرزوندشون نه بی آبی و بی غذای از پا میندازدشون. هیچ وقت نمی ترسن، هیچ وقت تسلیم نمی شن و بیشتر از تجهیزات به توانایی های فردی و مهارت هاشون تکیه می کنن. البته همیشه تجهیزات لازم رو دارن. Whaooooo, the man who touched the moon.!! Excellent composition and beautiful light. Touching the Moon! Beautiful visual metaphor! Il espère l'atteindre ?!!!!! belle capture ! He hopes to reach?!! beautiful capture! سلام ببخشید مدتی نبودم سعی می کنم از این به بعد مرتب به وبلاگ ارزشمند شما سر بزنم.راستی وبلاگ پارمیدا هم به روز شده. :) Sublime ! 5* Bravo Omid. Bon après-midi. Bises. Looks like he is going to pluck the moon from the sky, great composition!! Clever picture, great result ! Great use of depth. Nice trick. Visually impressive. Pas besoin de fusée pour aller sur la lune :) Splendide composition. Bonne soirée. This made me laugh! Excellent! Happy SIlly Tuesday! Impressive POV - to be able to put the finger on the moon ! !Very good and colorful shot. Clever portrait and beautiful views! I knew it was this small. Very funny image. Excellent work. Tener la luna tan cerca que casi poder tocarla debe de ser todo un placer! Muy buena! this is a great idea, omid! Etre là au bon moment ! omid - Great shot !! Are those Moon rocks ?? Very nice. Wonderful image! He can just about grab it! la señala... Genial disparo..Que lo pases bien.